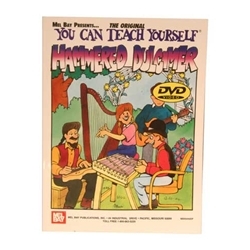 Our You Can Teach Yourself Hammered Dulcimer Set is a beginners book ,87 pages, and DVD set for the Mountain Dulcimer, by Madeline Macnile. Instructions on every aspect of playing the hammered dulcimer. Form detailed discussions on dulcimer layout, hammers, and tuning to extensive performance notes on every tune in the book. This book and DVD set provides a wealth of information for all students of the Hammer dulcimer. Madeline shows the novice player how to "map your way through" a new piece of music, finding clear musical directions through what at first must seem lie a maze of strings. Makes a great gift, for yourself or someone special.